Everything was perfect here, especially the buffet breakfast every option possible they had available. Staff were very helpful and beautiful people and service! Had a fantastic 5 night stay here. Beds were super comfy and the staff were amazing. Nothing was too much trouble for them. Highly recommend this resort as it is close to everything as well. We had a great stay at The Stones and I would highly recommend the hotel. Anything we requested was never an issue. The service was fantastic and the staff were very friendly. Rooms were beautiful. The only thing I would change would be for the ground level rooms to have a table and chairs sitting area near the plunge pool. We had an amazing 7 days at The Stones. I really didn’t want to leave. Everything was beautiful. Breakfast spread was amazing. Our pool room was gorgeous, unfortunately the water was too cold to get in. Swam & laid around the main pool instead. My only complaint would be about the “fridge” in the room. It’s actually only a wine cooler so doesn’t get cold enough to keep drinks/milk cold. We needed to keep medicine in the “fridge” which wasn’t at a cold enough temperature. This is my only complaint about the hotel. We thoroughly enjoyed our stay and we found your staff to be so very polite and helpful, always smiling. 0ur room was really nice and comfortable, in a quiet area of the hotel. The breakfast each morning was a delight, so much to choose from. Would come back again soon. Also we have recommended this hotel to our friends. Loved the bathtub on the balcony and great breakfast!! A gentleman named Wawan at the stones hotel pool service was super fantastic, brilliant personality & sooo friendly. Absolutely amazing, can not wait to come back. Love you Stones. Rooms were nice and clean, fairly newish. The staff were all super friendly. Food was tops! would help if to make it more difficult to keep sun beds and if people would remove their pool towetls when they leave the pool. This was our Second stay at the Stones hotel. Just can not fault it, will be back there very soon, already planning a Christmas stay. Organized a family get together over Nyepi Day and the Stones was a great place to relax and enjoy. Staff great, rooms lovely, food tasty and the drinks cold and often. Recommend a stay here to anyone. An absolutely great hotel. Thanks for recommending that particular property. Hello everyone, I’m Bill. I just returned from Bali and stayed at the Stones hotel. I must say that the Stones hotel wasn’t my first choice when booking because I was looking for something set among lush gardens with more of a tropical feel but it was recommended by the staff at travelonline so I listened to experts advice and booked it. Thank you so much to Claire Wilkinson and the team at travelonline. They managed to sort out my holiday within 24 hours despite my changing it around. They listened to my requests, and made some great suggestions. All I had to do was pay for it and enjoy my holiday which started 2 days later. The Stones hotel is a beautiful hotel but what made it stand out was the wonderful staff who were always close by with a genuine smile. I found myself waking up each morning and looking forward to being greeted by the staff members who would always smile and started calling me Mr Billy by the second day. Any business or organization is only as good as the people who strive to make it great (especially in the hospitality sector) and my heartfelt congratulations to the staff and management of both the Stones hotel and travelonline. I have travelled extensively and this trip was made very memorable because of my positive experience from start to finish. Thank you again and congratulations on a stellar job. With all sincerity and warmest regards, Bill Vatsilas. every aspect of this hotel was amazing !!! Great hotel, friendly staff and very good breakfast. Only reason for 4 star on location was we prefer Seminyak to Legion. Fantastic hotel with exceptional customer service. Great large pool. I would recommend they invest in an area with table tennis, more access to billiard table like a recreational room families can sometimes hang out in before or after dinner. Stayed 3 nights in adjoining rooms with my 2 sisters. We had a great time. The rooms were clean & generous in size. The location was great within walking distance to the Market in one direction, the Mall in the other & across the road from the beach for sunset drinks. We enjoyed the Spa & considered it to be great value along with a lovely experience. Housekeeping was very quick to respond with additional coffee and water at no additional cost. We also hired a driver for 1/2 a day to go to Tana Lot. He was very experienced with great English. We enjoyed the food at the hotel. Breakfast had all you needed and the meals were well priced for a 5 star hotel. Overall I would stay hear again for the location, quality facilities and service. We had a room on the 5th floor & even had a small view of the ocean. The nice thing about this property is that it is a haven in the middle of everything. Hotel clean and inviting. Staff friendly and helpful! Great Hotel, Great location. Staff were always extremely helpful and friendly. Amazing breakfast!! Fantastic service and very friendly and helpful staff. The rooms are nice and well kept. Pool area is beautiful. Wow....best hotel I have ever stayed at. The stones really was so beautiful. The rooms are bigger than your average hotel room and they are very clean. The outdoor bath was the perfect way to cool down in the privacy of your own room. All the staff were so friendly and helpful, they went above and beyond and no request was too hard for them. My favourite thing at the stones was the massive pool and the floating day beds in the water. We had lunch by the pool most days and it was so tasty, quick and easy. I highly recommend the nachos and the mai tai cocktail. The prices were very resonable for the quality you receive. All round I can't recommend the stones highly enough. The hotel really is just like the photos and the security is top notch, I have never felt safer. I can't wait to go back and stay at this beautiful place again. 5 stars all round. We were lucky enough to be upgraded to a Pool room with a View, absolutely beautiful, breakfast was fantastic so much variety. Service is excellent, pool is amazing, would definitely stay again. What can I say but what a great hotel. From the moment you check-in to the moment you leave the never ending smiles are always with you. Check-in fuss free, and a fruit popsicle is just the ticket to begin your stay. Deluxe Pool Room overlooking the swimming pool with a bath on the balcony-bliss. No loud raunchy music to upset your chill and relax frame of mind. When you do hit the pool, no mad trying to secure lounges(as some people do).There is always plenty available with a good mix of sunken ones or free standing ones. Did I mention the fruit popsicles, mocktail shots, sun-glass cleaning and sun cream or insect repellant that are offered to you during the course of the day. Happy hour and D-jay every day from 3pm. Food at the restaurant is really good and reasonably priced. The rooms are great with an expresso machine in the pool view rooms. Cleaning daily is well done. I can't complain. What I really like about the hotel is the level of service they provide. Every request is acted upon immediately and always done with a smile. Even changing your in room fridge. The staff are there to be of theutmost service. The location for me is great. Walking distance to Kuta Square and Beachwalk Shopping Centre or the other way to Melasti or Padma Street. Everything I wanted basically at my finger tips. Great Hotel and would definitely go again. This is a beautiful and luxurious hotel which we could not fault. Its our second time staying here and we will certainly return again. The pool and facilities are brilliant. Plenty of lounges in and around the pool with plenty of sunshine. Pool bar is fabulous. Exceptional butler service and talents, the best buffet breakfast, lunch and changing themed dinner menus. Every day whilst sitting around the pool staff come around in a boat distributing fruit kebabs to everyone whilst other staff give out free drink refreshments and clean your sunglasses and reading glasses. All staff were so polite, helpful and made our stay an enjoyable experience. Best location too. The hotel was clean and beautiful, the staff were wonderful and very helpful. Breakfast was amazing! And the pool area was gorgeous. The Stones is one of the best hotels I have experienced so far, the service was excellent, and the facilities were fantastic. Awesome resort, service was amazing. The pool is huge with a great pool bar. We had a premium pool room which was lovely although plunge pool was rather cold. Food was excellent although the turkey bacon at breakfast wasn't a hit with us and the sausages were still raw. Freshly made juices seem to be popular with everyone though! Overall is a beautiful place and would highly recommend and the service is 2nd to none! Our room was amazing. Breakfast was awesome every day and the staff were great. Thanks for the massage that was unbelievable, will definitely be returning to the spa next time in Bali. Great hotel, excellent service and fantastic staff attitude makes this hotel our number one preference for Legian accommodation. Excellent breakfast. Comfortable beds. We had a wonderful stay at the Stones Hotel all the staff we met were helpful and friendly. The choice of food available for breakfast was just amazing something for everyone. The service we received was outstanding and we could not fault anything about our stay. Thank you to everyone at the stones hotel. Awesome pool and excellent customer service. Highly recommended. Staff, Food and service were all excellent, Location fantastic. From the moment we arrived it was a great experience. Upgraded to a room with a plunge pool, the staff are exceptional and always there to help. The food was lovely maybe a little pricey same as drinks. Room was lovely and well serviced. The infinity pool was amazing to watch the sunset from while enjoying drinks. Would definitely go back. My stay at The Stones was top rate. From the moment we entered the reception area until the moment we checked out. The hotel itself, particularly the fantastic pool area, the staff with their friendly and professional service, the amazing breakfast and the level of security was first rate. I will definitely be staying at this hotel again. Hotel was beautiful,very clean,service fantastic & great ambiance. Very enjoyable stay. Friendly staff, excellent breakfast. The pool was very nice, enjoyed relaxing on the sun beds. My husband and i enjoyed this hotel, nearly no kids great for our age bracket 55 great breakfast and dinning will go again. Thank you to The Stones Hotel and friendly staff for our very relaxing stay. We would love to come back again soon. Love the Stones Hotel in Kuta, second time there and still best services and best food. We love it. I couldn't fault this hotel right from the double gated security to the reception arrival. The staff were fantastic service was excellent. Breakfast the best we've ever had. The pool was fantastic. Happy hour cocktails the best. Food for dinner so well priced and presented. Really recommend this hotel for all the right reasons. Novita at reception took a photo of us and surprised us with it in a lovely frame. Our family of 4 enjoyed a great weeks holiday at Stones hotel. We got a good priced deal & booked 2 garden view rooms, they gave us interconnecting ones. The staff were very pleasant, friendly & receptive to all our requests. We were very happy with the overall standard of this hotel, loved the pool, food & drinks were good, breakfast amazing. Great location up the road form the beachwalk with great shops and restaurants 15min walk into Kuta square. Would only stay here in Bali. The Stones was excellent. There was not a single thing I would change, the whole experience was excellent. Stones is a great hotel breakfast second to none. Its position is a bit hard as if you go out you have to go all around to Kuta to get back to hotel as streets are one way. Staff are lovely and cant do enough for you. the staff were excellent and very helpful. Maintenance and cleanliness was fantastic! A wonderful resort great attention to details, staff fantastic hellpful and delightful. Reception staff can arrange anything from restaurant reservations to day trips. Had a grwat holiday, well worth the money, excellent service, location and facilities. Will be staying there again. My partner and I have try to stay in different hotels each time I Bali but after our stay at The Stones we will be staying again. Can't say enough about the lovely staff there who can never do enough for you. A really great hotel, fantastic pool, really good breakfast with lots of variety. All staff were very attentive and friendly. Would recommend this hotel and would stay there again. The buffet breakfast is awesome, if you cant find anything to eat your to fussy. The hotel was clean and comfortable. Not to far from shops and the beach. Staff where really great and friendly. The only negative I have is that there was no real fun atmosphere to the hotel. Otherwise great. Out of three hotels we stayed this trip his was the best hotel. Also this is one of the best hotels I have been in. One of my Favourites! The staff were all very friendly and helpful, the whole hotel was clean and very well maintained, our room was amazing and the food there was fantastic! We stayed at The Stones for 7days, it was amazing. Staff were attentive, great attention to detail. Pool was fantastic, great water temp, always plenty of sun beds available. Breakfast was one of the best in Bali..Enjoy The Stones is our new favourite hotel! It was a lovely experience staying at the stones hotel. The staff were amazing and couldn't do enough for us. Would definitely recommend the stones to others, as well returning myself. Great hotel, amazing breakfast, wonderful service, incredible security and most comfortable beds! Close enough to Kuta shopping, far enough away too! Will be back! We were upgraded, but the room they put us in only had a glimpse of the pool. The breakfast was excellent everything you could want even ice cream. Everything was great with our stay at the stones. I will be recommending this place to all my friends. Will defiantly be going back there next year! Everybody was so polite and the rooms were awesome!!! As well as the pool, just overall great people and a great place to stay, would defiantly recommend it!!! Such a luxurious place to stay! Such a beautiful, upmarket and stylish hotel. The staff were amazing and provided a '6 star' service! The grounds, pool area and dining were picture perfect and Devine. The daily entertainment around the pool was beautiful! I loved the saxophone player walking around...so serene! Couldn't recommend a better place! Very central to everything as well. we are happy to go back there again as it had everything we wanted including service and great food ...a few problems with housekeeping, they were happy to rectify when these problems arose. security was excellent and we took our 85 year old mother with a walker, the staff could not do enough for her they were fantastic. Everybody treated us in a manner unsurpassed. The hotel was beautifull and only matched by the management and staff working there. Only negative about The Stones we found was the lack of tropical gardens. I would recommend the Stones for couples. (We left the kids at home) great location if you want to stay in Kuta / Legian. They've got it right this time! My friend and I had a really enjoyable stay. The pool is so big....amazing! Variety at breakfast....outstanding. Clean, comfy rooms. Lovely modern resort. I would stay here again without hesitation! This new hotel was opened last year and was recommended by a friend who stayed there in July. We really loved it, the rooms were great (we stayed in interconnecting rooms 263 & 265) and the kids could use access stairs just outside our door to get straight down to the pool. The buffet breakfast was excellent with a great range of food, and staff happy to cook eggs anyway you like and make any combination of fresh fruit juice... we took fresh fruit and pastries from breakfast to have later as mid-morning snacks - all good. The Stone`s Hotel was simply fantastic. The staff was friendly, professional. Our room was great. The breakfast had everything you could wish for, too much perhaps, I have some hard work in the gym in front of me. The location was central which suited us, as we were able to walk out the door and be on the beach in minutes. The pool area is outstanding. There was never a problem for any request we made. On our last day even though we checked out at 2pm, we were still able to use all the hotel facilities until we left at 7.30pm. I have no hesitation recommending the Stones Hotel to anyone. Breakfast is unbelievable, Safe, Peaceful & beautiful hotel, new, very clean, poolside view stunning, service A1, rooms little small but good enough for 2 people. no room for a roll in bed. I did view a corner room which is great for families big enough but these are limited so be quick but no door between bedroom and lounge area just an archway. Big TV, DVD player free you just need to ask for one. hotel only offer 1x King or 2 x singles not 2 x doubles as add states. Great kids club very clean, 1st 3 hours free then $1.00 per hour 8am-8pm. I believe you can organise private nanny if you wanted. Location is good if you want to walk 8 mins everyday to get to shopping markets, few cafes and restaurants within 4min walk. taxis cheap $2-4 per trip within 30 mins travel. Road in front is very busy with traffic, beach is over the road which you need to cross if you have a pram to get to a good stable footpath. Would stay again for sure. More for couples/families and corporate/executive clients. The hotel was great & rooms were big, the service was great, The pool is awesome & has beds in the water.you have to get the room with pool view with bath on Balcony!! The Stones Hotel was everything we could have asked for on our holiday. From the time you checked in till we left it was WOW!! Our room - a Deluxe Pool View was great. It was modern, a good size and had a bath and daybed on the balcony overlooking the pool. The pool is excellent in size and accommodates all types of guests with a swim up bar, large spa, kids play area, and many lounges to use so plenty of choice. The Stones Kitchen and the Rice Table restaurants were first class and the food very tasteful. They cater for both western and asian cuisine. Staff are very friendly and we don't think there were any times when we thought they could have done better. The Day Spa at the resort - Celestines was first class. Beautiful rooms and very reasonable prices. Overall a great time away for my wife and I. We would certainly stay there again. One thing for other guests to note would be the Pool Access Rooms. They are more expensive, and we feel not worth the extra money. There is nowhere to sit like we had in our balcony room, with only one chair and then the bed. Very good service, all people working at the hotel were very nice at the reception, cleaners and at breakfast always with a big smile. Good location, would recommend this hotel to everybody. Where do I start - this hotel is fantastic. It is located far enough away from the aussie bogans of Kuta, but still close enough to shops, restaurants and nightlife. The hotel is EXACTLY as described and pictured on the website. The rooms were a decent size and very clean, the staff were very friendly and helpful. 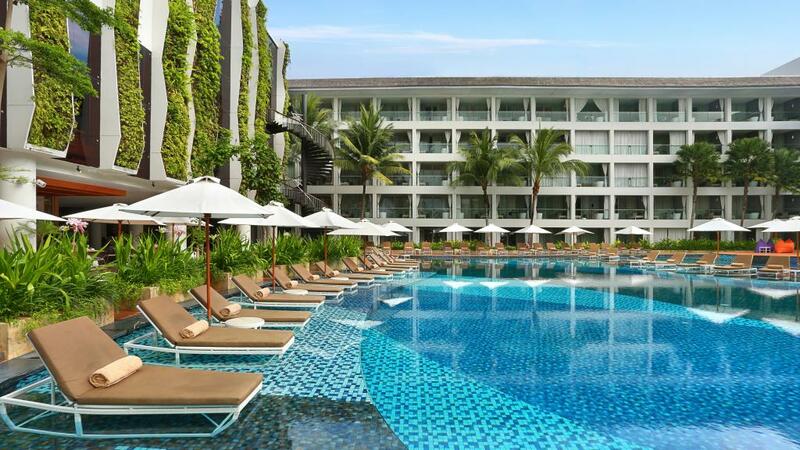 My husband and I have travelled extensively all over the world (including Bali - many times) and we can honestly say this is one of - if not THE nicest hotels we have stayed in. Breakfast is THE BEST we have seen - HUGE selection and variety each day. We will definitely stay here again! We had such a amazing time and felt the nice warm welcome of all the Balinese people and staff .